Newman Garrison + Partners (NG+P), Newport Beach, Calif., and LiveRoof, LLC, Spring Lake, Mich., announced the selection of the LiveRoof® Hybrid Green Roof System for the Park Landing Apartment Homes in Buena Park, Calif. 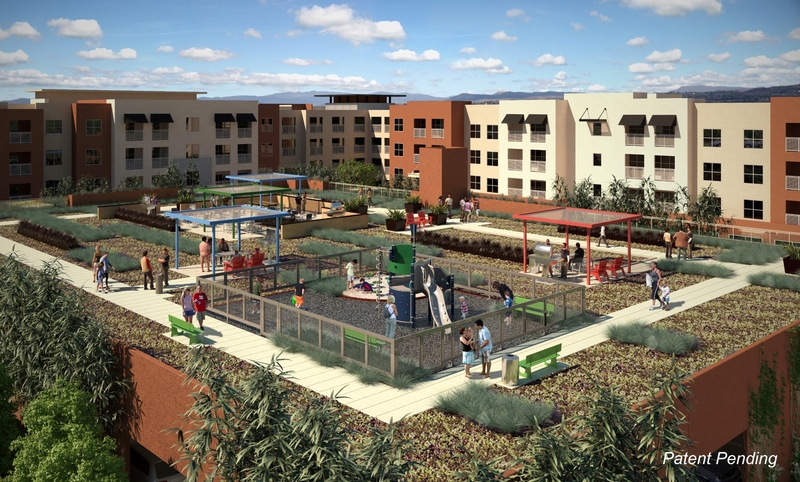 Developed by Jamboree Housing Corporation (Irvine, Calif.), one of California’s largest affordable housing developers, Park Landing is the first project based on New Block™, the urban village design concept NG+P invented to make it economically feasible to build and maximize density on in-fill properties previously deemed too small for development. Designed to achieve a LEED® for Homes Silver rating, Park Landing will provide 70 affordable rental apartment homes in a four-story complex served by surface parking covered by a green roof structure. Park Landing is located on a long-abandoned commercial site adjacent to a residential neighborhood. 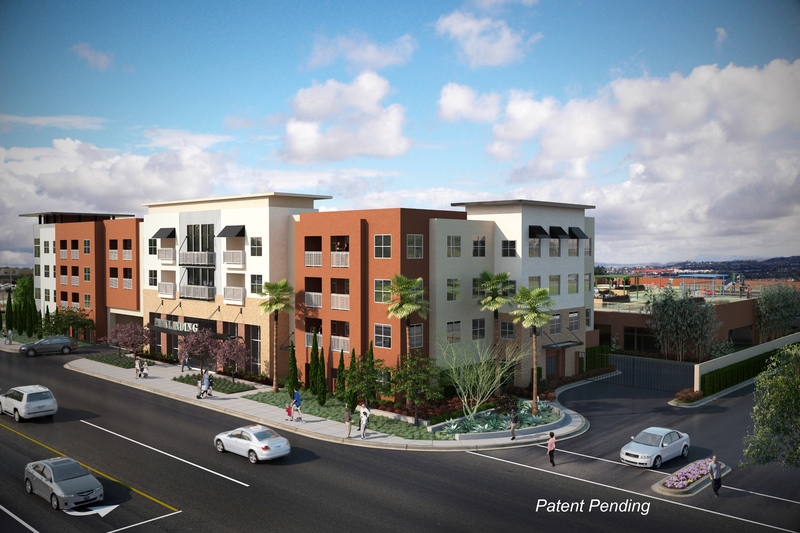 New Block™ solves a fundamental challenge for the project: fitting the 70 apartments on the 2.2-acre site while meeting the Buena Park Planning Commission’s requirement for a minimum of 14,000 square feet of open space. Newman Garrison + Partners (http://www.nggpartners.com), formerly known as Kaufman Meeks + Partners, is a team of highly trained professionals in Newport Beach, Calif. who have specialized for over 25 years in creating innovative, yet timeless, architectural design for mid- and high-rise towers, mixed-use, urban transit villages, urban infill, resort and multifamily communities, work-force, student and senior housing. NG+P has received numerous prestigious awards for outstanding design and land planning expertise and has a great depth of knowledge on how to plan and design creative and cost-effective design solutions. New Block™ advances urban infill and transit-oriented development (TOD) on smaller, constrained sites. New Block™ design with green roofs is an innovative approach for financially viable, community-friendly and sustainable urban development on small sites. Incorporating green roofs, in particular above parking structures, is central to New Block design. Founded in 1990, Irvine, Calif.-headquartered Jamboree Housing Corporation is an award-winning, broad-based nonprofit housing development company that develops, acquires, renovates and manages permanently affordable rental and ownership housing throughout California for working families, seniors and people with special needs. HOMES, Inc. and Housing with HEART are 501(c)(3) organizations and comprise Jamboree’s Resident Services Group. A leading nonprofit developer, Jamboree is committed to sustaining excellence with high quality affordable housing that is good for the environment, the economy and local communities. It currently has about $250 million in affordable housing projects in its development pipeline and a $1 billion asset portfolio that includes the development of and/or ownership interest in more than 6,600 homes in more than 65 California communities. Currently, Housing with HEART programs and services that foster learning, health and community building are offered at 38 Jamboree communities with designated staff at each location. For more information, go to http://www.jamboreehousing.com. 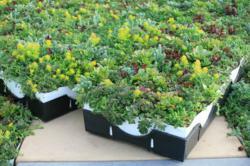 The LiveRoof® Hybrid Green Roof System (http://www.liveroof.com) is the industry’s most refined horticultural solution. LiveRoof modules establish a healthy, sustainable ecosystem on the rooftop to maximize membrane protection, energy savings, environmental benefits, and rooftop aesthetics. Licensed regional growers customize plant selection for every LiveRoof project. They deliver the modules abundantly vegetated with full-grown plants that have been selected, developed, and tested for beauty and the ability to thrive on the rooftop for decades. LiveRoof is simple to install. 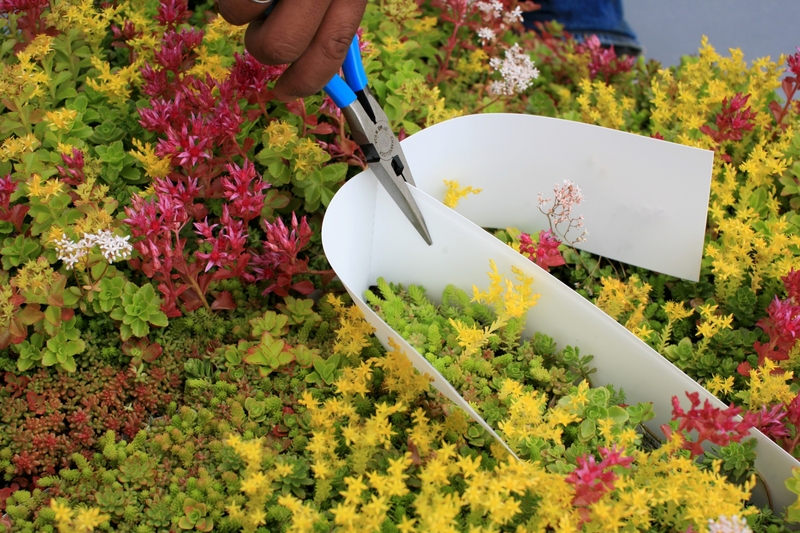 When installed, LiveRoof is an instant green roof with extensive coverage carpeting the rooftop. LiveRoof’s natural function and natural beauty offer the highest level of green roof performance with ultra-low maintenance costs. The proof is on the roof — showcased in over 600 LiveRoof installations that total more than two million square feet.